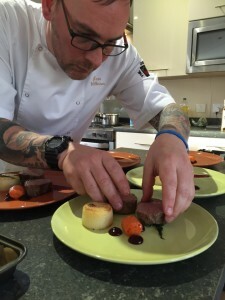 Woodys Lodge hosted its very own private dining experience with awarding winning Chef Sean Wilkinson. 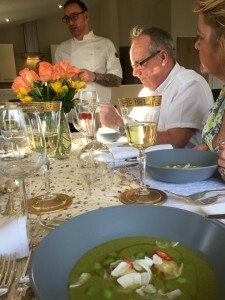 We had an absolutely amazing time having our own private chef for the late afternoon/early evening, from start to finish it was truly memorable. We opted for a 3 course meal of which Sean designed a menu tailored to our needs and budget. Baked from scratch and in the comforts of our lodge we started off with warm artisan bread and a thai inspired amuse bouche (we changed it from crab to chicken dumplings). Everyone thoroughly enjoyed this course, very different to what we were expecting and the flavours were intense! The starter consisted of a three cheese souffle with a walnut and watercress dressing – very light and subtle. The walnuts really complimented the dish. For mains we had beef which was cooked in a water bath for a couple of hours, rested and then cooked in front of us – scored a couple of tips for cooking the perfect steak. Fondant potatoes, beetroot cooked in a variety of ways and thyme smoked black garlic completed the dish which was beautifully plated. A chocolate & salted caramel delice with smashed cinder toffee, chocolate soil and chambord mousse with edible flowers was served up for dessert. Wow! Heaven on a plate! Sean spied our chambord and said “I’ve an idea, can I use some of your chambord”. Less than 15 minutes later he had whipped up another element. Fantastic to see! It was a brilliant experience and one I certainly will do again. The layout of the lodge was perfect as it meant we could watch Sean work and interact with the chef whilst sitting at the dining table. I’m now planning a girls pamper weekend with I think what will be a tasting session or perhaps tapas. Sean said he would bring his waiter too so we can watch them cook and serve up some cocktails, I think the hot tub and outdoors dining area will be a great setting for an informal and relaxed event. Sean caters for all occasions and budgets so why not treat your other half or get the girls together and experience it for yourself. I promise you will love it! P.S We have some special offers on throughout April and May for weekend and mid week breaks – from just £315 – check them out.